Another Las Vegas valley family is broken after the 115th deadly crash this year took the life of a 4-year-old boy. "You just feel the pain of the family," said Joann, who volunteers with the Trauma Intervention Program of Southern Nevada. Joann is one of the first responders to fatal scenes like Monday night's crash. Her job is to comfort and counsel the victim's family. She questions what it will take for driver's to begin paying attention to all the lives lost on valley roadways. "There are police vehicles and crime scene tape up and vehicles are still not stopping," Joann said. 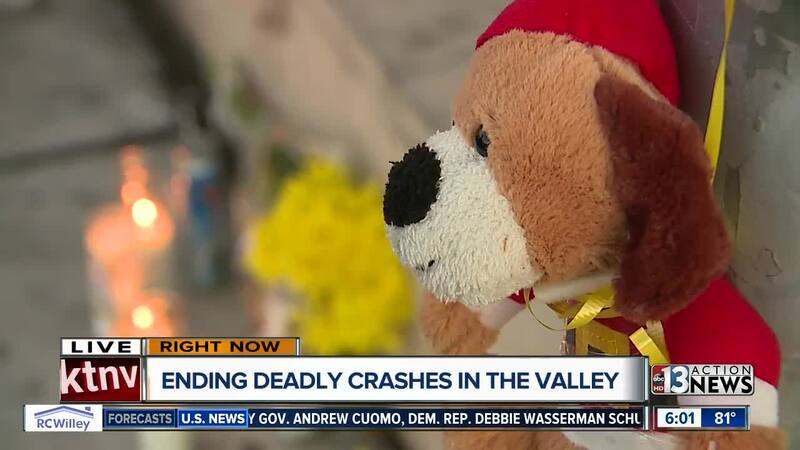 This year at least half a dozen valley kids have died on our roadways, which is one too many. "When we're on a call we hope the phone doesn't ring. We don't want anyone else to die," said Nicole who is also a volunteer with TIPS. Andrew Bennet with the Office of Traffic Safety knows the reality of losing a loved one at the hands of another driver. "I lost a sister to a car crash," Bennet said. His sister Lindsey was a college freshman when she was hit head-on by a drunk driver in 2009. "That's the first time I felt hopelessness," Bennet said. He has now made it his mission to give other families hope. The Office of Traffic Safety is working on the "Zero Fatalities" initiative across the state. They also provided $1.4 million dollars in overtime to law enforcement for extra patrol last year and supported a new law that would require all people convicted of DUI to have an interlock device placed in their vehicle. "These were lives that were lost, families that were forever broken and dreams that will never come to fruition," Bennet said.